(Professional Dance Instructors Association) was founded to maintain a standard of teaching that has been set forth by top reputable professionals in all styles of Partner Dancing. It is designed to aid in giving you the tools as an instructor to better explain, demonstrate and teach any movement related to dance. 1. How to prep for your 1st group class or how to build your existing class(es). 2. How to properly describe movement, actions, and terminology. 3. How to manage and plan for a class. 4. How to manage and plan for a workshop. 5. How to manage and progress in teaching private lessons. 6. How to dance both lead/follow of West Coast Swing to variations. 7. How to “diagnose”and correct problems (and/or prevent them). 8. How to foundationally explain movement, theory and body mechanics. 9. How to implement and use Drills with your students. Complete a 5 hour GPDIA course. 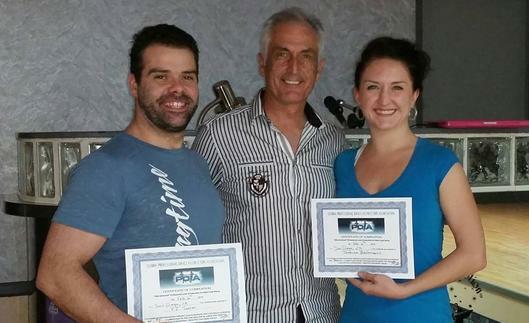 Successfully complete the GPDIA exam for each level you wish to be an instructor of. Comprised of a 20 question written exam with a minimum grade of 75% in order to continue to the practical and oral exam. Pay for the course, exam and annual certification fees. Recognition and listing on the GPDIA website (once certified and Certification maintained). Achieve and maintain a standard of teaching set forth by reputable professionals. Ongoing tips and support from online training (once certified and Certification maintained). Improving your craft and skills as an instructor by improving your quality of delivering knowledge to students, communicating & demonstrating what you do. Improve your ability to help students achieve their personal goals. Private Rate: If you choose to take the course individually, the course is $350 + $150 for exam + Hourly Private lesson rate of instructor for 5 hours + Floor Fees for 5 hours. Maintenance of Certification: There is an annual fee of $30 paid directly to GPDIA to maintain your certification. This enables you to access online Continuing Education Classes and other useful teaching tips from upper level certified professionals. If annual fee is neglected, your name will be removed from the website (suspension of eligibility to run certification courses) NOTE: Participating instructors are not certified unless listed on the official GPDIA website. Where to I get Certified? Tashina travel to and are hired at multiple events throughout the year. If you are interested in getting certified contact her directly to inquire for a location near you! !